During the academic year 2017-18, Cwmfelin will be working towards becoming a Rights Respecting School. We aim to educate pupils about their rights and help them understand that they have responsibilities too. Our committee will aim to involve staff, pupils, parents and Governors who will work together to develop children's rights in our school. What is the RRS award? 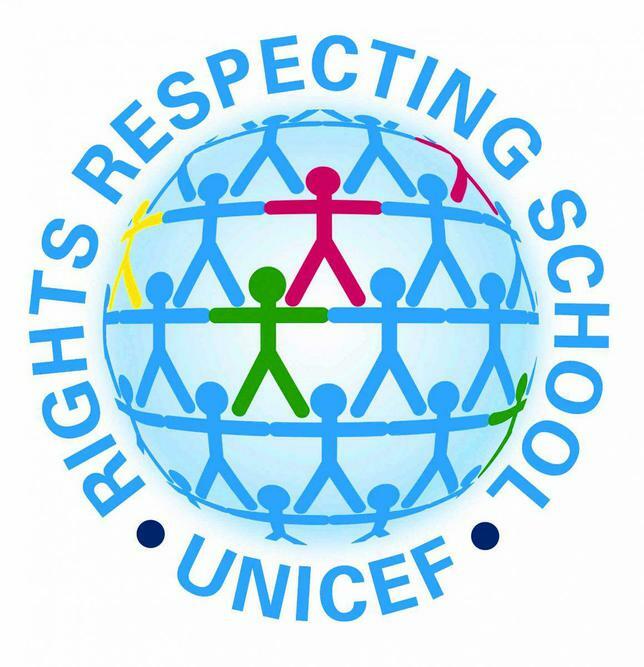 The Rights Respecting Schools award (RRSA) is an initiative run by Unicef who work with schools in the UK to create safe and inspiring places to learn, where children are respected, their talents are nurtured and they are able to thrive. The Rights Respecting Schools Award embeds these values in daily school life and gives children the best chance to lead happy, healthy lives and to be responsible, active citizens. Our school will place the UN convention on the Rights of the Child (CRC) at the heart of our ethos and curriculum. Super Ambassadors is a scheme from the Children's Commissioner for Wales that aims to promote children's rights and the UNCRC in Primary Schools. Here are our Super Ambassadors who are working hard to ensure that children at Cwmfelin know their rights and responsibilities. Ripley the Rights Respecting Rex. Congratulations to Reuben Hughes in Class 6 for this creative, colourful design. Our Ambassadors meet regularly at lunchtime on a Friday to discuss our action plan and record progress. We recently met with our Headteacher, Mrs Morgan, to discuss our ideas for improving routines at lunchtime. We welcomed our Link Governor, Mrs Sharma-Thomas, to our meeting to share our Silver award action plan and give an update on our progress. We are proud to announce that we have been awarded our Bronze award for our commitment to Rights Respecting Schools. Now to go for the silver! During February, we looked at Article 7, the right to a name. Every child was set homework to research the meaning of their name and create a poster to display. We enjoyed talking to our parents and finding out why we were given our name. At Cwmfelin, we all recognise that we were born with a name and have the right to be called that name and no other. We celebrated St David's Day in March and all pupils entered competitions with a Welsh flavour to demonstrate our right to our own nationality. Here we are, sharing our work with Mrs Sharma-Thomas, our link Governor. We look forward to our Friday tweet to update our Twitter page using the #Rightshour. During April and May, pupils have been finding out more about their rights. Our assemblies give us the opportunity to discuss Rights and we have carried out lots of activities in class such as matching rights to pictures, identifying rights from a poster, watching Newsround and discussing rights and finding out where in the world children are not receiving their rights. In June, we carried out work linked to World Environment Day and discussed our responsibility to look after our world by reducing, reusing and recycling. We are all trying to reduce the amount of plastic we buy and use as we want our oceans to be clean and our sea creatures to be safe. We are giving Mrs Sharma-Thomas a tour of the school and an update in readiness for our Silver award assessment. We are very proud to announce that we have achieved the Silver Award for our work towards becoming Rights Respecting. Our assessor, Sarah Hook, was very impressed with our Ambassadors and the way they represented the school during our assessment. Well done everyone! Here is our new banner that will proudly be displayed outside our entrance.